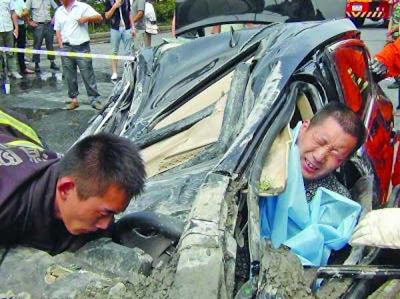 A Chinese motorist survived after not only getting crushed by the metalwork of his car, but also getting his feet trapped in quick-drying liquid concrete. The accident happened in Yangzhou city in east China’s Jiangsu province when a cement mixer was driving down a road behind a minibus. Police spokesman Chi Tao said: "A schoolboy apparently decided to cross the road, running across in front of a minibus that he hadn't seen, which was then forced to slam on its brakes. 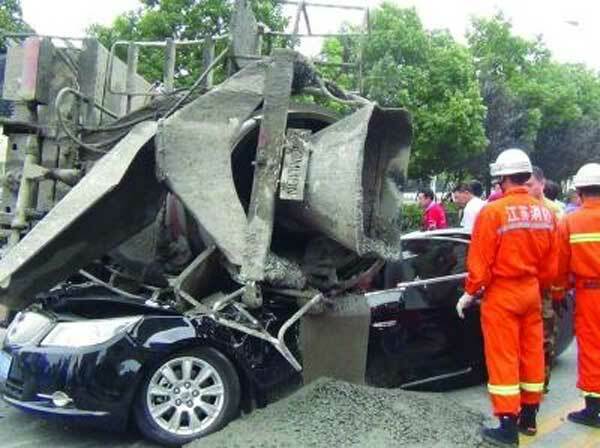 Unfortunately, the cement mixer with a full load was behind the minibus and although the driver slammed on his brakes it was clear he was not going to stop in time. "In order to avoid hitting into the back of the minibus, the cement mixer driver swerved out on to the other side of the road and the cement mixer tipped over. It crushed a car and although the driver survived the initial collision, liquid concrete poured in through the smashed windscreen and filled up the car, starting to solidify around the trapped man's legs." Firefighters said they realised they needed to act quickly because if the concrete solidified the man, 48-year-old Lian Huang, could have died. According to medics limbs that are sealed in concrete quickly swell up causing circulation problems and even death. In addition the heat from the man's legs was causing the concrete to dry out even more quickly. As a result the man's pain increased to the point where he was in agony by the time he was finally freed and rushed to hospital where he was treated for circulation problems and several fractures. Though probably not a huge help in this situation.. If you want to prevent concrete drying too quickly, dump any kind or sugar (even honey) into the mix. It all but stops the curing process. After 40 years in the building industry, I have yet to see concrete that hardens in a couple of hours, let alone minutes, and if there is one, how come it doesn't dry in the rotating bowl of the truck ? Whenever I lay a pad for a house the concrete needs at least 4 hours of complete stillness to even partly solidify. Rapid setting concrete has to remain dry until needed, the water acts as a chemical catalyst, so that rules out rapid set in this instance. Me thinks that maybe someone in China was exaggerating. And there I was about to trust them ! Heh heh, you could well be right about the exaggeration! arbroath: When a signals room on the London Underground recently was flooded with cement, I believe a quick raid on the nearest Tesco was how they were able to slow it down long enough to pump it back out. No matter how bad a day you're having, at least you weren't the on to flood a control room, break the underground and inconvenience millions of people. I remember that happening, but hadn't heard about the involvement of sugary Tesco products.